Denville Township is a township in Morris County, New Jersey, United States. As of the 2010 United States Census, the township’s population was 16,635, reflecting an increase of 811 (+5.1%) from the 15,824 counted in the 2000 Census, which had in turn increased by 2,012 (+14.6%) from the 13,812 counted in the 1990 Census. 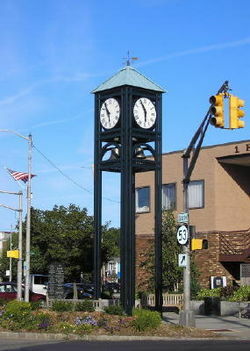 Denville is known as the “Hub of Morris County” for its location along major transportation routes at the center of the county. In 1988, as part of the town’s 75th-anniversary celebration, a time capsule was buried that contained “artifacts” from that era. Native Lenape Native Americans were known to travel the Minisink Trail for centuries before Europeans arrived in New Jersey. Part of that trail cut across what is now southern Denville, roughly following the course of Route 10 and Mount Pleasant Turnpike. Some research has indicated that there was a Lenape campsite along the trail in Denville, on or near the Ayres / Knuth Farm Historic Site along Route 10. When Dutch and English settlers began to arrive in the new world in the early 17th century, the Minisink Trail was the likely route they traveled to explore the interior. Daniel Denton, one of the purchasers of what is known as the Elizabethtown Tract in 1664, led an expedition into the interior of northern New Jersey. In 1670, he wrote the first English language description of the area. Some researchers conclude that the name “Denville” derives from Denton. Some researchers have suggested that European settlers began to come to the Denville area as early as 1690. These early settlers were primarily Dutch and English from Long Island, Quakers from Philadelphia, and Germans. William Penn and several other proprietors began to survey and stake out lands in the Denville area around 1715. These surveys are the first documentation of Denville. Between 1730 and 1760, several forges and mills were erected in Denville along the Rockaway River and the Denbrook. A number of communities associated with the forges and mills began to emerge. Ninkey and Franklin in southern Denville developed around the forges there of the same names. Denville village developed around the Job Allen Iron Works. Early developers of Denville, such as the Hussa family and A.B Crane & Co., were intrinsic in shaping the residential and lake communities. A letter from early Denville settler John Hinchman in the year 1800, recounts some of the oral history of Denville from 50 years earlier, as stated to him by some of the elders of the time. Hinchman explains in his letter that the naming of Denville can be traced to a “den” of wild animals located in the swampy regions along the Denbrook and Rockaway River. The animals would bask on a knoll that juts out into the meadows where they were hunted by the native Lenape. 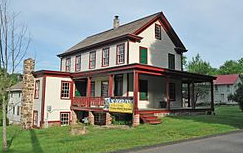 This “den”, Hinchman states, was the basis for the name of Denville and the Denbrook. According to the United States Census Bureau, the township had a total area of 12.641 square miles (32.741 km2), including 11.867 square miles (30.736 km2) of land and 0.774 square miles (2.005 km2) of water (6.12%). Unincorporated communities, localities and place names located partially or completely within the township include Cedar Lake, Cooks Pond, Cooper Lake, Franklin, Indian Lake, Lake Arrowhead, Lake Estling, Lake Openaka, Openaka Lake, Rock Ridge, Snake Hill and Union Hill. 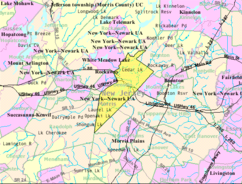 Neighboring towns include Morris County communities Mountain Lakes and Parsippany-Troy Hills to the east, Randolph to the south and west, Rockaway Borough to the west and Rockaway Township to the north and west as well as Boonton Township to the north. The Tourne county park is in portions of Denville, Boonton Township and Mountain Lakes. The park covers more than 540 acres (220 ha) of undeveloped land and offers a view of the New York City skyline from its peak standing 897 feet (273 m) high. Denville has 11 named bodies of water within township limits. The four major residential lake communities are Cedar Lake, Indian Lake, Rock Ridge and Lake Arrowhead (including Great Bay and Bay of Deep Waters). Estling Lake is a private summer community, which has some full year residents. The three minor lakes are Cooper Lake, Hollstein Lake, and Openaki Lake. The town also has Cooks Pond, a recreational lake available for public use by membership. 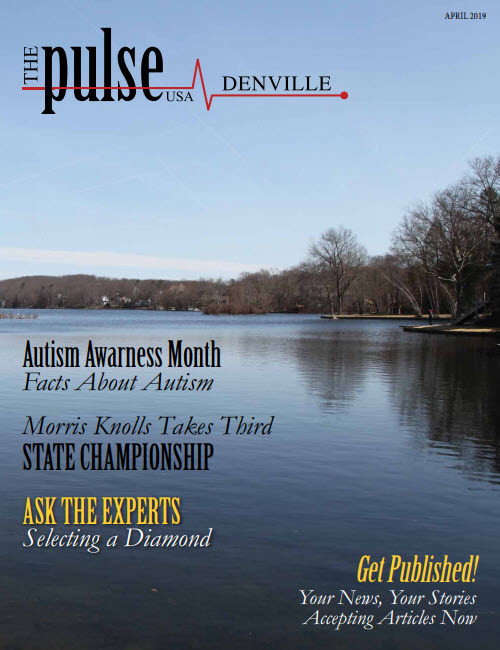 Most residents of Denville live in the non-lake communities in the township, including Bald Hill, Union Hill, and Beacon Hill communities. The game of American flag rugby was first played in Denville, introduced to the town by resident Tom Feury. As of the 2010 United States Census, there were 16,635 people, 6,432 households, and 4,509 families residing in the township. The population density was 1,401.8 per square mile (541.2/km2). There were 6,734 housing units at an average density of 567.4 per square mile (219.1/km2). The racial makeup of the township was 89.49% (14,887) White, 1.42% (236) Black or African American, 0.12% (20) Native American, 6.52% (1,084) Asian, 0.01% (1) Pacific Islander, 0.78% (129) from other races, and 1.67% (278) from two or more races. Hispanic or Latino of any race were 5.31% (883) of the population. There were 6,432 households out of which 32.1% had children under the age of 18 living with them, 59.8% were married couples living together, 7.6% had a female householder with no husband present, and 29.9% were non-families. 25.6% of all households were made up of individuals, and 13.1% had someone living alone who was 65 years of age or older. The average household size was 2.57 and the average family size was 3.12. In the township, the population was spread out with 23.7% under the age of 18, 5.9% from 18 to 24, 23.0% from 25 to 44, 31.7% from 45 to 64, and 15.7% who were 65 years of age or older. The median age was 43.4 years. For every 100 females there were 91.4 males. For every 100 females ages 18 and older there were 87.9 males. As of the 2000 United States Census there were 15,824 people, 5,990 households, and 4,312 families residing in the township. The population density was 1,307.1 people per square mile (504.5/km²). (in the 2010 Census there are 16,635 people). There were 6,178 housing units at an average density of 510.3 per square mile (197.0/km²). The racial makeup of the township was 92.64% White, 1.14% African American, 0.08% Native American, 4.64% Asian, (in the 2010 Census it was 1,084 or 6.5%), 0.03% Pacific Islander, 0.44% from other races, and 1.03% from two or more races. Hispanic or Latino people of any race were 2.64% of the population. There were 5,990 households out of which 33.0% had children under the age of 18 living with them, 62.8% were married couples living together, 6.4% had a female householder with no husband present, and 28.0% were non-families. 23.6% of all households were made up of individuals and 11.4% had someone living alone who was 65 years of age or older. The average household size was 2.59 and the average family size was 3.11. The median income for a household in the township was $76,778, and the median income for a family was $90,651. Males had a median income of $63,413 versus $42,392 for females. The per capita income for the township was $38,607. About 1.7% of families and 2.8% of the population were below the poverty line, including 2.4% of those under age 18 and 5.3% of those age 65 or over. Denville Township is governed within the Faulkner Act, formally known as the Optional Municipal Charter Law, under Mayor-Council plan F, as implemented as of January 1, 1972, based on the recommendations of a Charter Study Commission. The township is governed by a mayor and a seven-member Township Council, all elected to four-year terms of office. Four council members are elected from each of four wards. Two years later, the three at-large and the mayoral seats are up for election. As of 2017, the Mayor of Denville Township is Republican Thomas Andes, whose term of office ends December 31, 2019. Members of the Denville Township Council are Gene Fitzpatrick (R, 2017; Ward 3), Douglas N. Gabel (R, 2017; Ward 1), Christopher Golinski (R, 2017; Ward 2), Donald Kuser (R, 2017; Ward 4), Stephanie Lyden (R, 2019; at-large), John Murphy (R, 2019; at-large) and Nancy Witte (R, 2019; at-large). 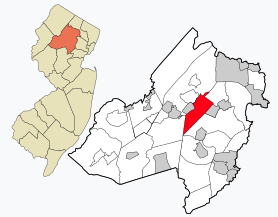 Denville is located in the 11th Congressional District and is part of New Jersey’s 25th state legislative district. For the 116th United States Congress, New Jersey’s Eleventh Congressional District is represented by Mikie Sherrill (D, Montclair). New Jersey is represented in the United States Senate by Democrats Cory Booker (Newark, term ends 2021) and Bob Menendez (Paramus, term ends 2025). For the 2018–2019 session (Senate, General Assembly), the 25th Legislative District of the New Jersey Legislature is represented in the State Senate by Anthony Bucco (R, Boonton Town) and in the General Assembly by Tony Bucco (R, Boonton Township) and Michael Patrick Carroll (R, Morris Township). The Governor of New Jersey is Phil Murphy (D, Middletown Township). The Lieutenant Governor of New Jersey is Sheila Oliver (D, East Orange). Morris County is governed by a seven-member Board of Chosen Freeholders, who are elected at-large to three-year terms on a staggered basis, with either two or three seats up for election each year as part of the November general election. The Freeholder Board sets policies for the operation of six super-departments, more than 30 divisions plus authorities, commissions, boards and study committees. Actual day-to-day operation of departments is supervised by the County Administrator, John Bonanni. As of 2016, Morris County’s Freeholders are Freeholder Director Kathryn A. DeFillippo (Roxbury Township, term ends December 31, 2016), Deputy Freeholder William “Hank” Lyon(Montville, 2017), Douglas Cabana (Boonton Township, 2016), John Cesaro (Parsippany-Troy Hills Township, 2018), Thomas J. Mastrangelo (Montville, 2016), Christine Myers (Mendham Township, 2018), and Deborah Smith (Denville, 2018). Constitutional officers are County Clerk Ann F. Grossi (Parsippany-Troy Hills Township, 2018), Sheriff Edward V. Rochford (Morris Plains, 2016) and Surrogate John Pecoraro (Mendham Borough, 2019). As of March 23, 2011, there were a total of 11,789 registered voters in Denville Township, of which 2,288 (19.4%) were registered as Democrats, 4,951 (42.0%) were registered as Republicans and 4,542 (38.5%) were registered as Unaffiliated. There were 8 voters registered to other parties. In the 2012 presidential election, Republican Mitt Romney received 55.5% of the vote (4,898 cast), ahead of Democrat Barack Obama with 43.1% (3,805 votes), and other candidates with 1.3% (116 votes), among the 8,863 ballots cast by the township’s 12,128 registered voters (44 ballots were spoiled), for a turnout of 73.1%. In the 2008 presidential election, Republican John McCain received 54.5% of the vote (5,266 cast), ahead of Democrat Barack Obama with 43.7% (4,230 votes) and other candidates with 1.2% (118 votes), among the 9,670 ballots cast by the township’s 12,226 registered voters, for a turnout of 79.1%. In the 2004 presidential election, Republican George W. Bush received 58.5% of the vote (5,214 ballots cast), outpolling Democrat John Kerry with 40.5% (3,606 votes) and other candidates with 0.6% (68 votes), among the 8,914 ballots cast by the township’s 11,605 registered voters, for a turnout percentage of 76.8. The Denville Township School District serves public school students in pre-kindergarten through eighth grade. As of the 2011-12 school year, the district’s three schools had an enrollment of 1,817 students and 138.9 classroom teachers (on an FTE basis), for a student-teacher ratio of 13.08:1 Schools in the district (with 2011-12 enrollment data from the National Center for Education Statistics) are Lakeview Elementary School (grades PreK-5; 709 students) Riverview Elementary School (K-5; 431), and Valleyview Middle Schoo (6-8; 677). Students in public school for ninth through twelfth grades attend Morris Knolls High School, which is located in Denville but has a Rockaway address, along with most students from Rockaway Township. The high school is part of the Morris Hills Regional High School District, which also serves the residential communities of Rockaway Borough and Wharton. As of the 2014-15 school year, the high school had an enrollment of 1,583 students and 142.7 classroom teachers (on an FTE basis), for a student-teacher ratio of 11.1:1. St. Mary’s Prep is a K-8 elementary school founded in 1954, and Morris Catholic High School is a four-year comprehensive Roman Catholic regional high school that was founded in 1957, both of which are operated as part of the Diocese of Paterson. The chamber is focused on making the community and business districts a better place for businesses, residents, and visitors. Each year a pair of teenagers are crowned as Mr. and Miss Denville. They are participants in a winter holiday parade and weekend-long celebration. They are chosen for their volunteer work in Denville, and overall hard work. As of May 2010, the township had a total of 47.82 miles (76.96 km) of roadways, of which 26.48 miles (42.62 km) were maintained by the municipality, 14.69 miles (23.64 km) by Morris County and 6.65 miles (10.70 km) by the New Jersey Department of Transportation. The Denville station offers train service to Hoboken Terminal or to Penn Station in Midtown Manhattan via Midtown Direct on NJ Transit‘s Morristown Line and Montclair-Boonton Line. Denville is actually two stations located within the same property. The Morristown Line station is two platforms located on a curve while the Montclair-Boonton Line station is a single platform next to the closed Denville Tower. NJ Transit offers local bus service on the 875 and 880 routes, which replaced service that had been offered on the MCM2 and MCM10 routes until June 2010, when NJ Transit pulled the subsidy. Denville is served by Lakeland Bus Lines with frequent service to the Port Authority Bus Terminal in Midtown Manhattan. Newark Liberty International Airport is located 27.5 miles (44.3 km) southeast of Denville in Newark, New Jersey. Other nearby airports include LaGuardia Airport (43 miles from Denville) and John F. Kennedy International Airport (54 miles from Denville), both of which are in Queens, New York City. Vickie Paynter (born 1971, class of 1989, former professional tennis player. Laura San Giacomo (born 1962), actress who played the role of Maya Gallo on the TV sitcom Just Shoot Me!